The banjo neck heel radius is a subtle detail that makes all the difference. Nearly all stringed instruments have the neck attached at an angle. Fiddles, cellos, guitars, and yes, even banjos have a small angle built into the neck/body joint. This small angle allows for adjustment to take place. It also increases the angle of the strings across the bridge. The sharper the angle of the string across the bridge the more downward pressure is communicated to the head. Too sharp an angle is not so good as it can result in an instrument sounding too “lively”. Too flat an angle is not so good either as it may render the instrument dull. Fiddles often have a neck angle of seven degrees, many flat top guitars have only one degree of neck angle. My favorite banjos have a neck angle of 3 degrees. 3 degrees allows for a bridge height that I find to be ideal for clawhammer playing, not too high or too low, about 5/8″ tall. Cutting the banjo neck heel radius is complicated because the neck will be attached to a round hoop. It is structurally and acoustically important that this joint have a good fit. Not only should it be angled but it also must have a radius that is cut at the proper angle to fit the hoop and deliver the desired playability. The banjo neck heel radius jig is used to assist in cutting the heel of the neck so that it will mate cleanly with the rim. It helps cut an angle and a radius at the same time. 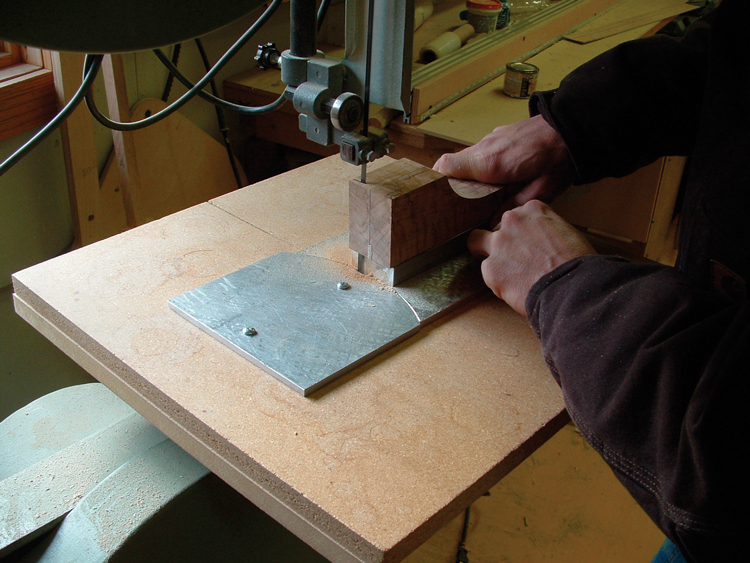 It consists of a plate that screws or clamps onto the saw table of a band saw. The plate of the jig has two halves, one half has a convex arc and the other has a concave arc. The arc should have a diameter a tiny bit less than the diameter of the rim you intend to use. On the side of the plate that has the concave arc there should be a wedge that will hold the neck at 3 degrees from the plane of the plate. This jig can be made from wood or it could be made from metal. Top view of the neck heel radius jig. 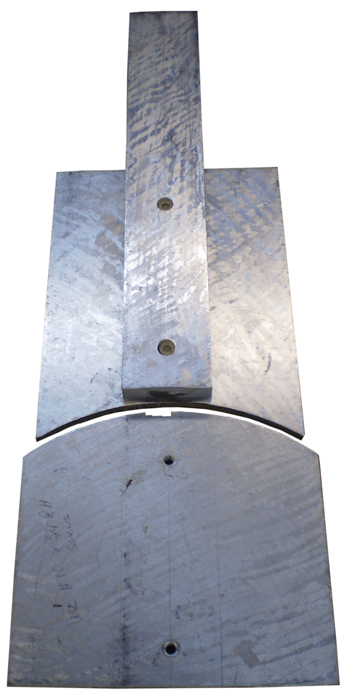 Side view of the neck heel radius jig. After cutting the banjo neck heel radius with the band saw a sanding wheel jig may be used to get all the saw marks off the heel of the neck. This also allows us to adjust our radius and angle a little bit. I have also done the job by hand with a piece of sand paper attached to the waste cut off the heel of the neck. It is best to wait for this part of the job until the rim has been turned on the lathe. Waiting allows the actual pieces to be fit together at near finished dimensions and make totally sure that the fit is good. If you choose to use a sanding wheel, it is usually best to use one that is of a slightly smaller diameter than that of the rim. It is very important that these jigs be constructed well and used properly. Use some scrap to test your work. If the neck is mounted on the jig crooked the neck will be crooked when it is mounted on the banjo. This is a mistake I have made. Although it may still result in a playable banjo, people will look at you funny ; ) It is a good idea to have a good sharp blade on the band saw for this job. The sharper the blade, the less sanding will need to be done. If you’re doing the sanding by hand, take good care not to modify the radius or the angle. 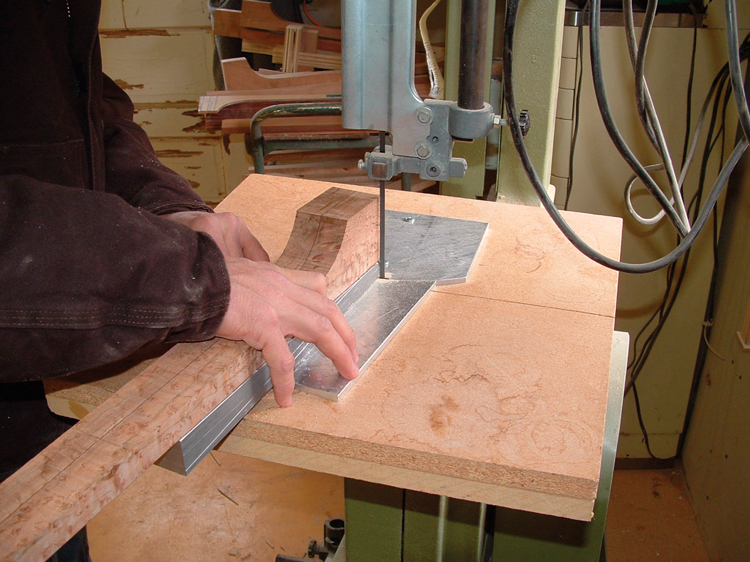 Here we see the neck heel radius jig at work with band saw.